The Black and Decker CM2060C is a highly powerful cordless electric lawn mower with a power swap option wherein you can swap the power input easily between two batteries that are provided with the lawn mower unit. This light weight electric operated push behind lawn mower unit is powerful enough to perform like gas powered models while being environment friendly. It is also cordless, so it can be transported anywhere without worrying about the length of any cord and the limitations associated with it. Overall a powerful user-friendly lawn mower that is apt in tackling medium and small sized yards up to 1/4th of an acre in size. The Black and Decker CM2060C is mainly built of tough and durable plastic. Thus its extremely light in weight. The cordless lawn mower weighs around 47lbs and is one of the most light weight mowers available. It can be easily moved through the grass on your lawn. The compact mower measures 34”x16”x22” and can be easily stored utilizing less space in your garage. The lawn mower has a easy to carry handle right above the deck. There is an additional grip just in front of the mower deck which can also be used to carry it while transporting it to or from the storage space. It has a foldable handle with a comfortable grip, a handle bar and a ignition kit containing a safety key insertion hole and a button to start the engine. The Black and Decker CM2060C features 7” front wheels and 10” rear wheels for easy movement. The Black and Decker CM2060C comes with two 2.5Ah 60V Lithium Ion batteries. Each battery has an individual indicator attached to its body that gauges the exact amount of charge in the battery. The area right above the deck has a compartment wherein the batteries are inserted. Once the batteries are inserted you can pull over the cover to close the compartment. There is a switch that helps you swap the power from one battery to another along with an indicator corresponding to the charge of each battery. The Black and Decker CM2060C has a 20” wide cutting deck with a single point height adjustment lever that allows you to adjust the height of the deck. There is a covered area on the left side of the deck for side discharge, a mulch plug and a rear bag for collecting the clippings for later disposal. The Black and Decker CM2060C is backed by a two year limited warranty and a reliable Black and Decker customer support system. The lightweight push behind Black and Decker CM2060C enables you to easily push it through the grass lawn.The ergonomically designed handle aids in the maneuvering of the lawn mower. The light weight, the ergonomic handle and the rugged wheels allow easy navigation of the lawn mower across the yard. The height of the handle can be adjusted in accordance with the height of the operator using simple press keys. This allows for easy height adjustments and enables the operator to move the mower comfortably without putting any strain on his/her back. There is an additional easy to carry handle and the grip in front of the mower deck allows you to carry this light weight mower easily from the storage space to the area of use or vice versa. This is an interesting feature and you need not drag the mower back to the storage space. You can just conveniently lift it using the handle or the grip and carry it along. Starting the Black and Decker CM2060C does not pose any problem whatsoever. You have to start off by inserting the key in the ignition unit. This is also a safety feature and eliminates any risk of accidental starting of the engine. Once the key is inserted the battery charge indicators will tell you the exact charge each battery has. You can swap the battery in use with the rocker switch if you need to, then push the start button in the ignition kit and press the handle bar to engage the blade. The Black and Decker CM2060C is powered by a 2.5Ah 60V lithium ion battery. Each individual battery can provide about 35-40 minutes of cutting time. The Black and Decker CM2060C is equipped with a powerswap technology which enables you to swap the power from one battery to the other with the help of a simple switch. When the charge of one of the batteries is being exhausted and can be well understood by looking at the indicator you can simply push the switch to swap the power from that battery to the next and carry on the mowing uninterruptedly. Some may feel that a 36V 4Ah or a 7Ah battery could have increased the mowing time in a single charge. The batteries take around four hours to charge using the fast charger that comes with the unit but only one battery can be charged at a time. 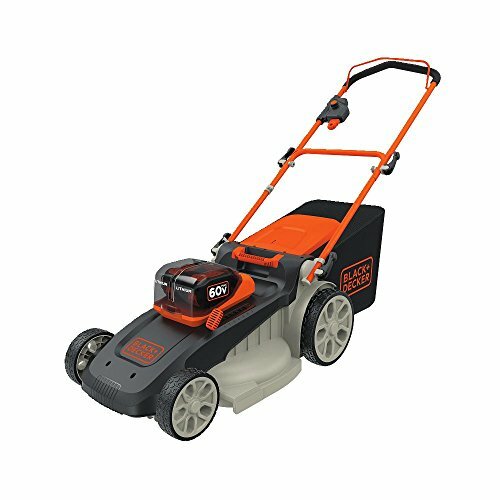 The Black and Decker CM2060C has an Auto sense technology that senses the strength and density of the grass and draws the power from the battery in accordance with that. This feature is extremely useful and boosts the battery life and enhances the time for which the charge lasts. The 60V battery powers the blades in a 20” wide cutting deck. The cutting deck with the super sharp blade cuts even tough and dense grass clippings with precision. The Auto Sense technology supplies the power sensing the density of the grass so that no power is wasted but the grass is cut without the need for multiple passes. The height of the cutting deck can be easily adjusted with the single point lever that allows you to adjust the height to six different positions between 1.3” and 4”. The Black and Decker CM2060C has three modes of clippings management viz Mulching, bagging or side discharge. The mulch plug when engaged chops the clippings into finer pieces before discharging them into the field for decomposition. If you want to side discharge the clippings, you have to remove the cover from the side discharge and see to it that the mulch plug is not engaged. On other occasions you can also collect the clippings in the bag at the rear end of the mower for later disposal. Overall a decent cordless electric mower with dual batteries and a powersnap technology that enables you to handle medium sized yards with ease and comfort, the Black and Decker CM2060C is also environment friendly and does not emit harmful gasses or make any noise and can be your perfect companion that can be used in places where environmental safety standards are maintained.